On the first day of the match, the trophy for the winner of the match was shown in the VIP lounge for a few minutes, and I managed to take a few pictures. Well, nobody asked me NOT to take pictures, to be precize! However, I decided not to publish them, because I thought that it would be annoying for the organizers if a picture of the trophy would be published at the start of the match on a blog and not on the official website. Therefore I decided to wait a bit, but after the 12th game today, the trophy was officially presented in the VIP room by the artist, Andrey Molchanovsky. So finally, I can open my vault and share the pictures with you. 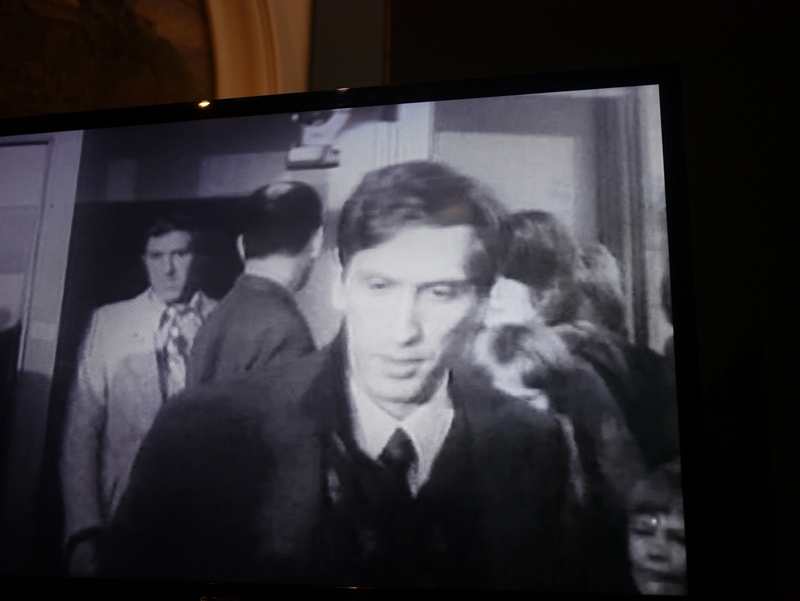 On the first match day, only a few people were allowed in the VIP lounge to take a look at the trophy: you may recognize Ilya Levitov, Kirsan Ilyumzhinov and Andrey Filatov. Next to Filatov is the creator of the sculpture, Andrey Molchanovsky. Irina Lebedeva, the director-general of the State Tretyakov Gallery, is carefully studying the trophy. A proud artist showing his work. More information about Andrey Molchanovsky can be found on his website http://www.molchanovsky.com/. You can recognize the crown in the chessboard. The trophy is made of gold and bronze, the chessboard is made of optical glass. The trophy weighs about 8 kg. The inscription on the socket reads: World Chess Championship 2012. There is additional prize for the winner, sponsored by the Tretyakov Gallery. I don’t know if these are the championship games that are inscripted, but it looks nice. You can also see the chess pieces on the trophy. Your Chessurfer with the trophy. Picture taken by Dirk-Jan ten Geuzendam. 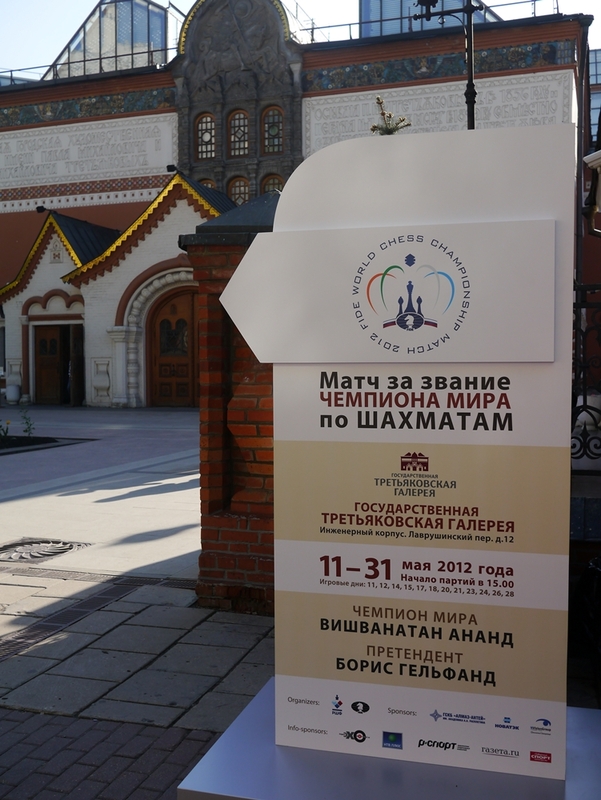 The World Chess Championship was opened in the Tretyakov Gallery on Thursday. The opening press conference started at around 18:30 and at 20:15 the official opening finally started, in an absolutely beautiful setting in the Tretyakov Gallery. I have made tons of pictures and it is just too much to post everything in only one go. 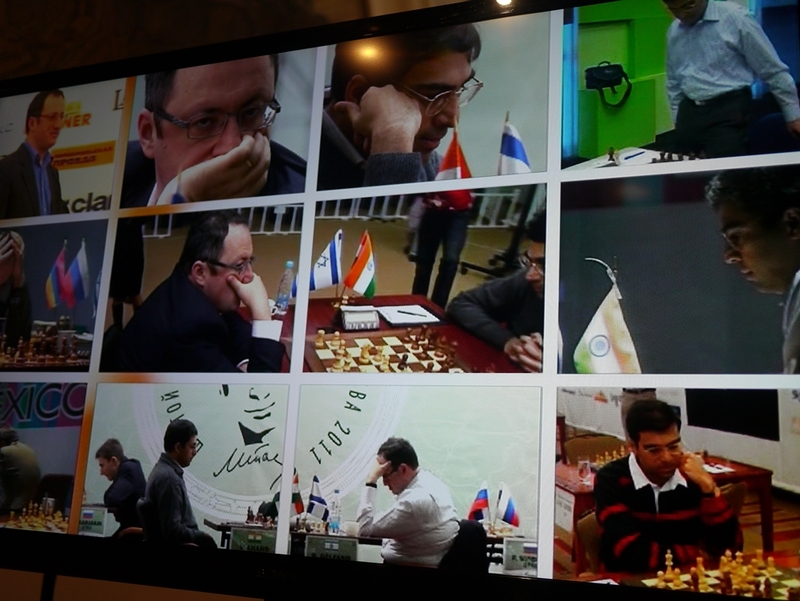 But…I don’t want to show you the usual pictures, which you can find on the main chess websites. Here is a first selection of the press conference and the opening. I will post some more shots of the opening and after party later. The livestream of the opening is available on the official website. http://moscow2012.fide.com/en/ in excellent quality. Highly recommended! The entrance of the Tretyakov Gallery. It is the first indication that there is a chess match going on in Moscow. I did not see any signs or posters announcing the match in the city. Update: Stock wrote an article (in German) about the match and the opening ceremony. “Was zählt, ist auf dem Brett”. Talking about tall guys. This is Peter Doggers, editor in chief of ChessVibes, getting ready for the press conference. Check his reports on http://chessvibes.com/. Man, he is tall. http://en.wikipedia.org/wiki/List_of_tallest_people. Doggers: “Haha, I was standing on a table”. 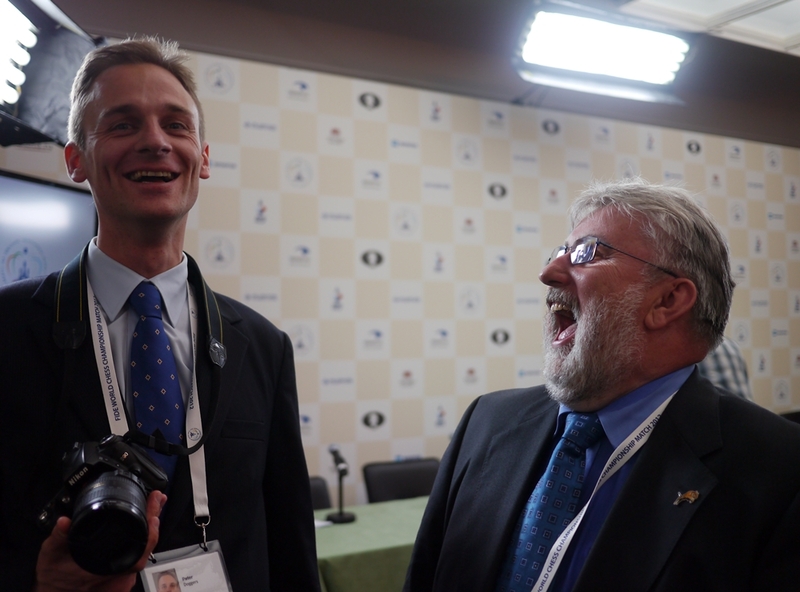 VIP guest GM Evgeny Bareev with Etery Kublashvili, who takes pictures for the official match website. A couple of years ago during a match in Maastricht, where Evgeny was playing against the computer engine Hiarcs, we went to the movies. It was a James Bond movie in which the North Koreans were the “bad guys”. Evgeny was disappointed after the movie: “The Russians are not the bad guys anymore, not even in a Bond movie”. 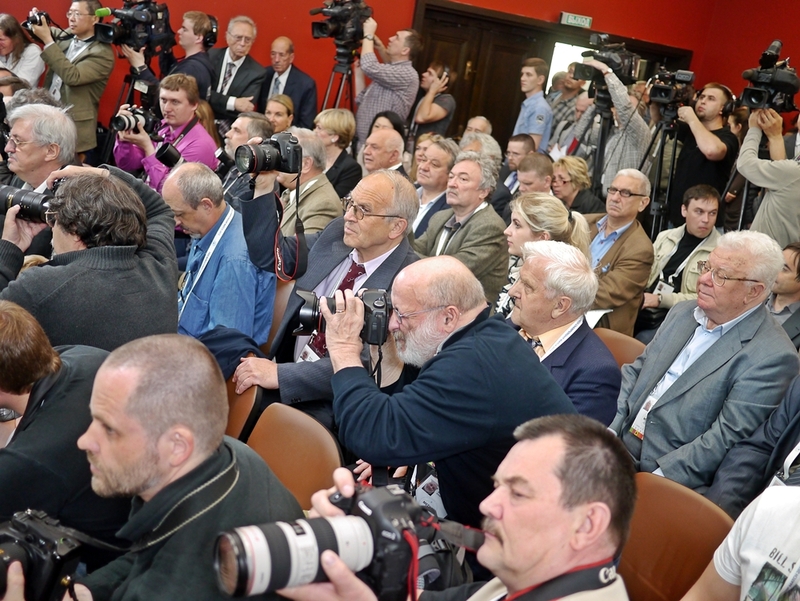 Dozens of journalists and photographers…. 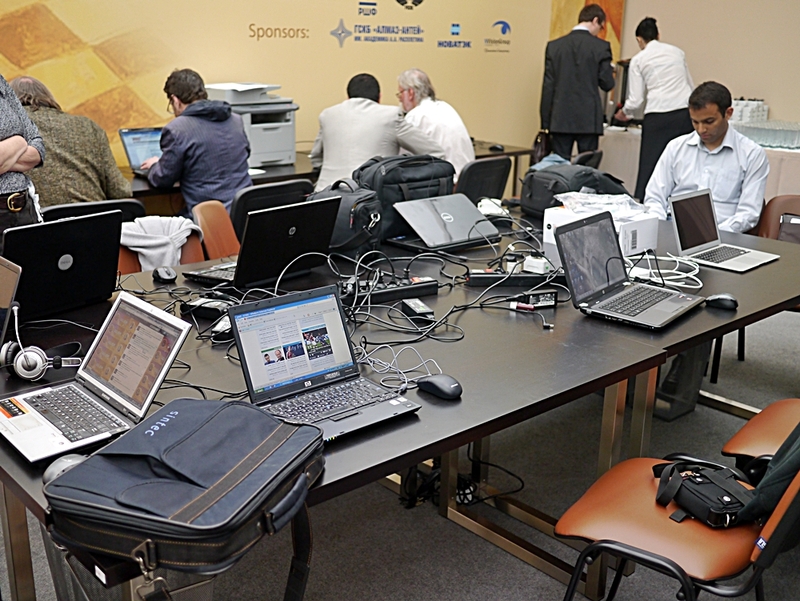 ….left their laptops alone in the adjacent room. 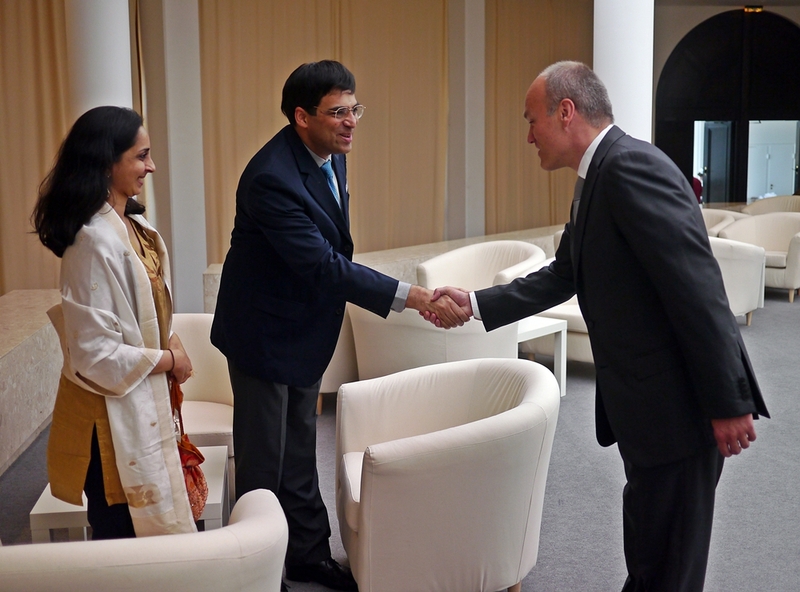 After the press conference, Vishy and Aruna Anand met match sponsor Andrey Filatov in the VIP room. 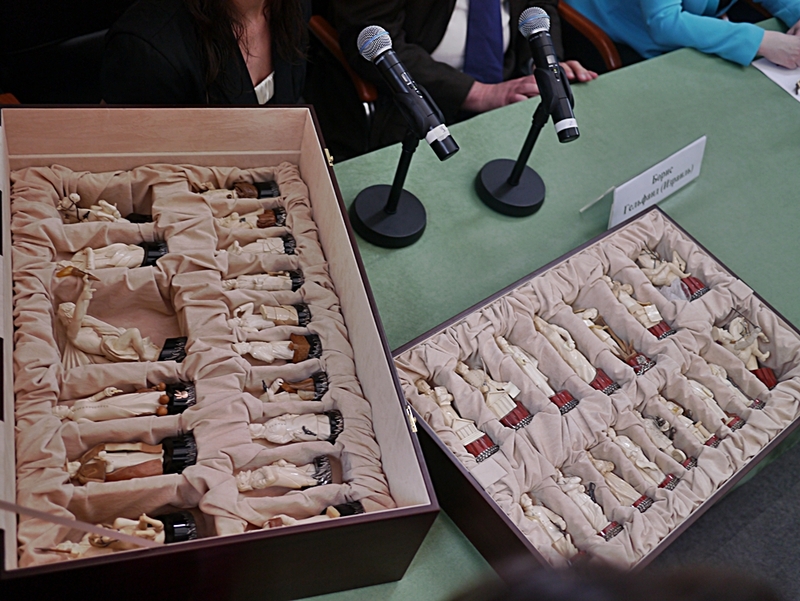 Filatov donated this chess set made of mammoth bones to the Tretyakov Gallery. 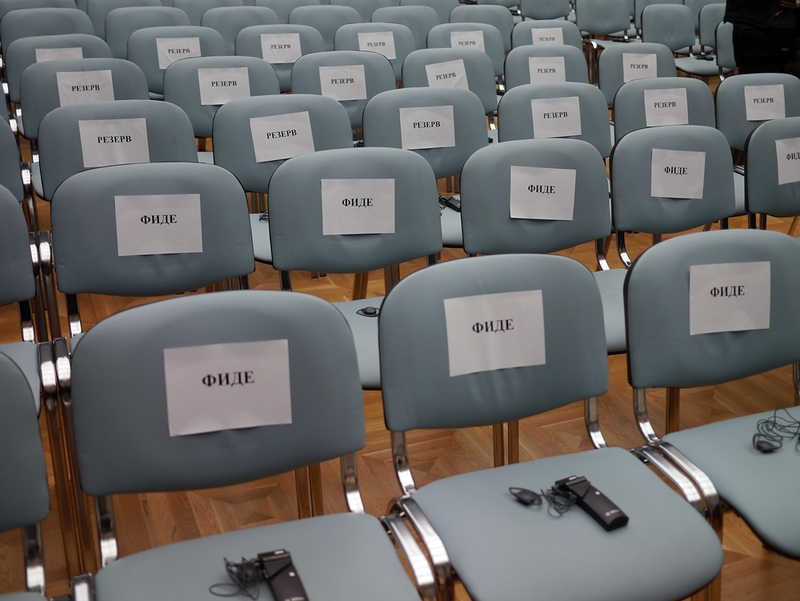 Lots of chairs for the FIDE guys….but where are they? 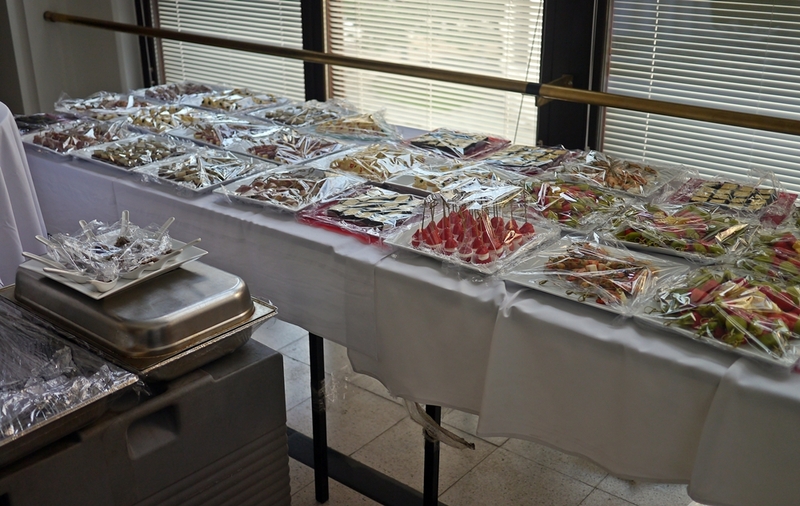 …not at the buffet? Remarkable. 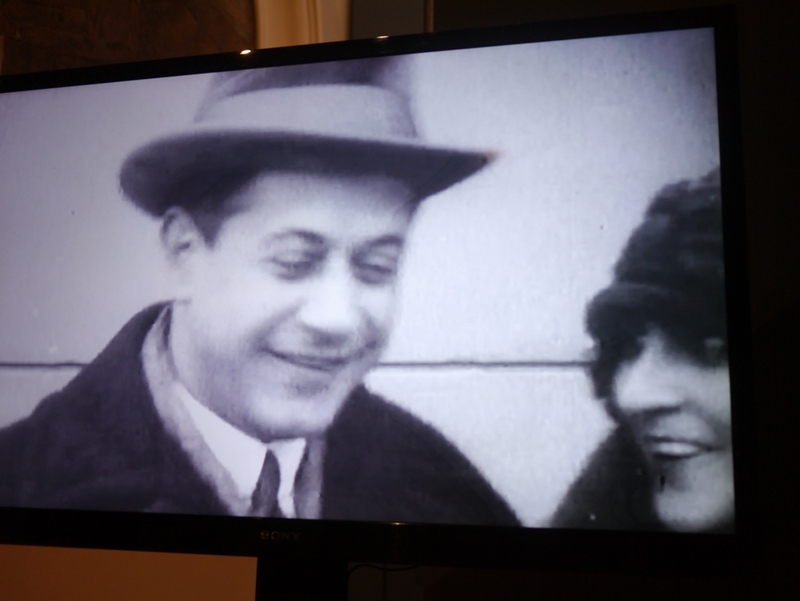 And of course Gelfand and Anand were introduced to the audience in the film. Time to play some chess now! In part 2: Michail Gorbachov, Anatoli Karpov, Nigel Short, Sergey Karjakin and a hot photographer. 30 May: That was close!